What are the SCROLLS of the Singing Women of West Bengal (India)? Scrolls are long strips of painted paper on which a story is depicted; they are also called Patachitra, a name that is derived from two Sanskrit words, namely Patta, which means a piece of cloth, and Chitra, which means a painting. These strips are used by storytellers for their narration and are kept rolled up. Scrolls have age-old origins and were created as a means of communication and entertainment; they are found in different parts of India and Bangladesh. 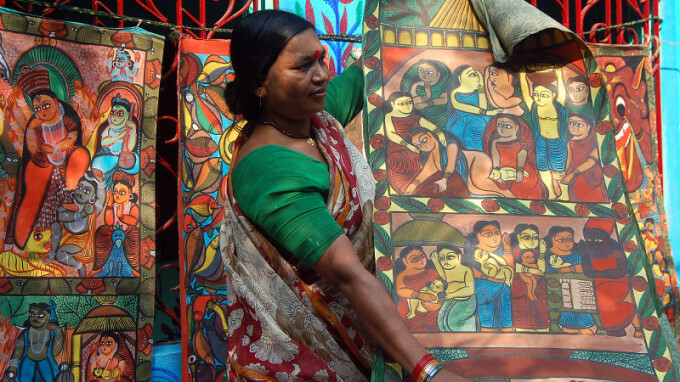 The Singing Women of West Bengal are storytellers who have revived the tradition of the itinerant Indian storytellers of the past. These ancient storytellers wandered from village to village and narrated stories using such scrolls which they had painted themselves and which they slowly unrolled accompanying the flow of pictures with an explanatory song. This type of performance stems from the popular Indian theatre known as Jatra. The strips are made up of several pieces of paper, either hand or commercially produced and generally 50 to 60 cm wide. The various pieces of paper are sown end-to-end to obtain the desired scroll length, which can vary from 2 to 5 meters. The storyteller depicts the story in sequence and decorates the edges. Fabric – pieces of old saris – is glued on the rear side of the strip to strengthen the scroll and make it easier to unroll. The pigments were originally made from natural plant or mineral based ingredients. Today, however, industrial colours such as temperas or acrylics are mostly used. The painting technique of the Singing Women has remained unchanged for centuries, passing down from generation to generation. The painted stories are unrolled from top to bottom and proceed by sequences, a kind of storyboard before its time. Figures are first outlined with contours defined by dark colours, and then filled in with flat coloured backgrounds. A peculiar feature of these paintings is their two-dimensionality and the total absence of perspective. Their expressive power springs, instead, from bold combinations of bright colours.